Generations of women have contributed to engineering, and Clark School women are proud to be part of that tradition. In honor of women’s history month, the Clark School is celebrating one female engineering faculty member each day. Read about today’s featured faculty member, Avis Cohen. 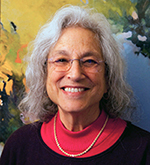 A research professor emeritus with the Institute for Systems Research and the Department of Biology, Avis Cohen is one of the true pioneering women in academic STEM fields. In an age when women were not encouraged to enter "hard science" careers, Dr. Cohen was already married with two children when she received her Ph.D. from Cornell University in 1977. She held post-doctoral positions at the Karolinska Institute in Sweden, and Washington University in St. Louis before returning to Cornell University where she had her own laboratory studying the organization of the lamprey spinal cord. She and her mathematician colleagues developed groundbreaking theoretical treatments of systems of coupled non-linear oscillators. At Cornell she also began exploring the process of spinal cord regeneration in lampreys. Dr. Cohen joined the University of Maryland's Department of Biology (at the time, Zoology) in 1990 and retired with emerita status in 2014. She is a University of Maryland Distinguished Scholar-Teacher. She established and directed the Program in Neuroscience and Cognitive Science, an interdisciplinary graduate program that combines training in cognitive and computational methods with traditional neuroscience, one of the few such programs in the country. Dr. Cohen also began working with the Telluride Workshop in Neuromorphic Engineering. She was one of the directors and co-PI on the NSF grant funding this innovative program.